The AFL School Ambassadors who go that step further in promoting football at their school are awarded at the AFL School Ambassador awards. The previous winners and a short description of why they were awarded are listed below to shed light on the best practices of AFL School Ambassadors. Christiaan introduced before school sports and school Breakfast Club to help develop a love for physical activity and healthy living. He partnered with Swan Districts FC to run the Swans Kids Program at Ashfield for Year 1-4 boys and girls, assisting Bassendean JFC to recruit new players. Christiaan linked with Noongar Sports to run training and games during lunch times. He encouraged participation from all students, as a result a quarter of Ashfield’s Eagles Cup team is made up of girls. Indigenous attendance has increased by 14%, suspension rate has dropped 33% with many of these students involved in football programs. In his own time Christiaan runs the Ellenbrook Auskick Centre and staff report that he often manages to steer staff room conversation to his beloved Essendon Football Club. 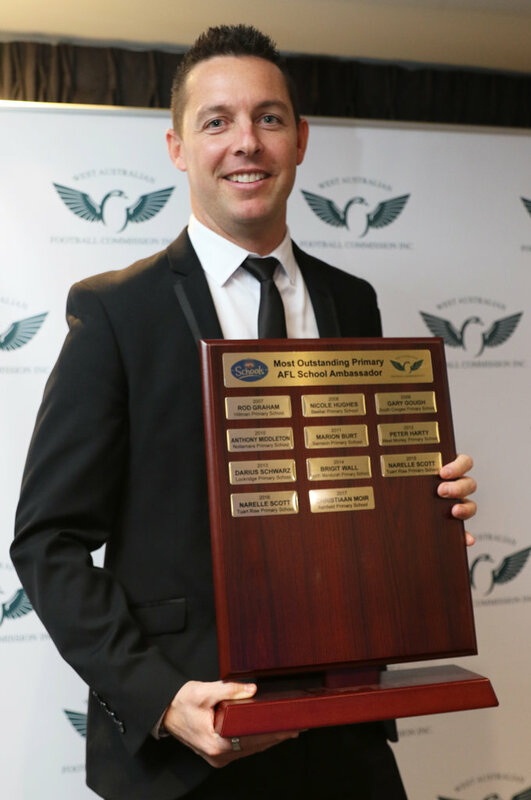 Thomas established the Wanneroo Secondary College Specialist Football Program Facebook page to communicate with parents, staff, students and the wider community. He developed Specialist AFL report cards for students work in a semester. Thomas is the Multicultural Ambassador for Secondary Schools in the West Perth District. He has established an expectation that it is mandatory for Football Specialist students to be involved in all athletics and swimming carnivals and represent the school where possible. Thomas has developed links with Wanneroo JFC to encourage students to join the local community club and now school matches are played at Wanneroo’s home ground. He maintains strong ties with local primary schools to give students the opportunity to develop umpiring and coaching skills at lightning carnivals. 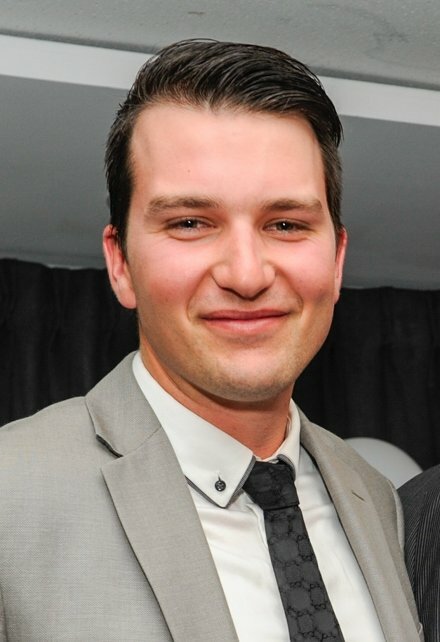 Thomas is an assistant coach with the SSWA Under 15’s team and is coach of the West Perth Year 10 Development Squad. Jake introduced Eastern Hills SHS to the Year 8/9 Eagles Schoolboys Cup and co-ordinated a Freo House Footy Program involving 120 Year 8-10 boys. He also achieved a 90% student attendance record and effectively engaged students who had otherwise been reluctant to participate at school. In the process he developed a relationship with the Hills Rangers JFC and the school was set to participate in the ‘Rangers Next’ after school program in 2017 as a result of Jake’s work. Jack created and implemented an inaugural Auskick program for Kindy to Year 2 girls and boys. He also worked closely with Peel Development Officers Elly Lambkin and Emma Swanson throughout the program and the encouragement provided by the female role models resulted in girls making up a third of the participants. Additionally he co-ordinated the Dockers Cup for the Baldivis Area Sporting Schools Association where he initiated customised rules to ensure maximum participation and he prepared the Tuart Rise team for the Dockers Cup with assistance from female role models. He also collaborated with other AFLSAs at the school and assisted with tipping competitions and classroom football-themed activities. 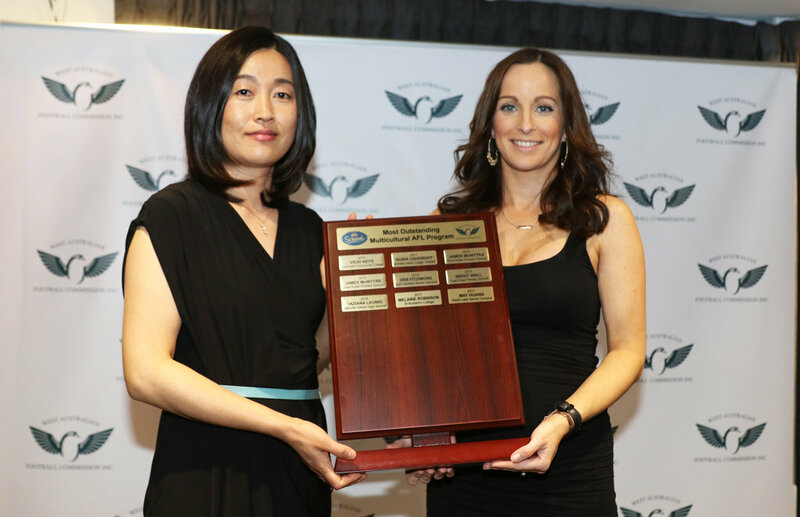 Taziana co-ordinated the first Australian Football program within the Intensive English Centre at Melville SHS, including internal matches and a guest appearance from female AFL player and Multicultural Ambassador Sabrina Frederick-Traub. The program was designed to enhance the health and well-being of the students and, with the students coming from a range of cultural backgrounds, and assisted their transition into Australian culture. A section of the students’ graduation from the Intensive English Centre now is based on the football program. 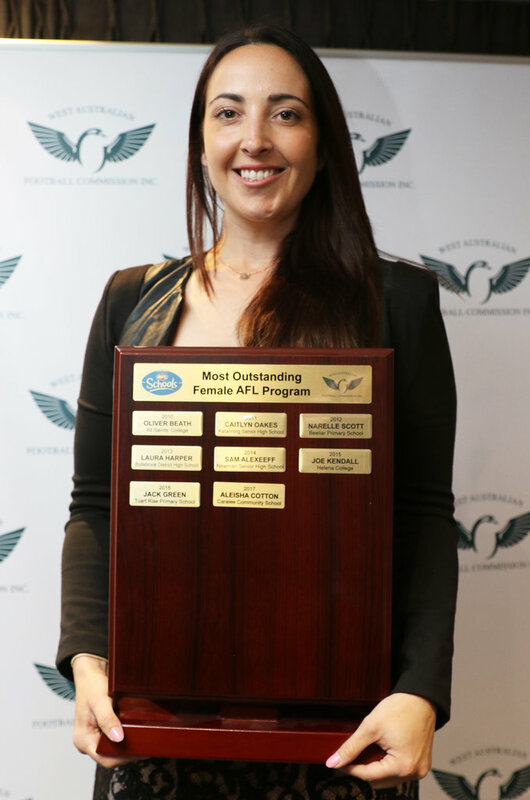 Taziana was also instrumental in assisting five students to transition into community football. 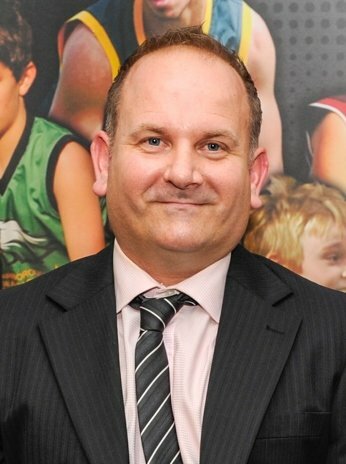 Simon implemented the Diversity Umpiring Program, JB Cup Footy and Work Expo and introduced a Youth Girls School football team to Yule Brook. He also assisted the PE teacher to set up a Freo House Footy Program for the first time. Student attendance was approaching 100% as a result of finding opportunities for boys to find work out of school and engaging district staff to assist with programs. 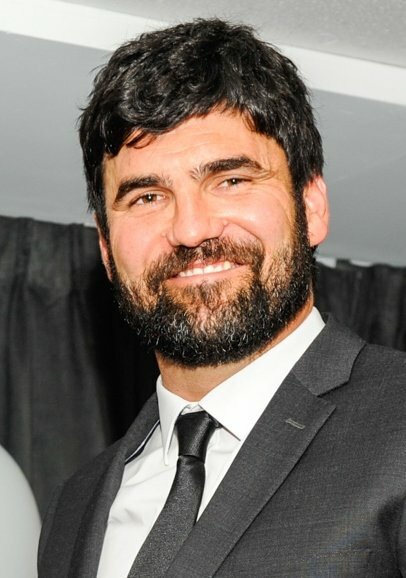 Additionally, Simon worked with community leaders, assisted boys to attend school, helped with students’ football commitments on weekends and helped with the Nicky Winmar Cup. Tom organised a partnership with a school in Papua New Guinea where the Wanneroo students sent out welcome letters that included information and videos about Australian Football. Additionally, on a school visit to Cambodia, Tom, staff and students taught the basics of football and donated equipment to children in villages. Back at home he also co-ordinated an inaugural indigenous ‘friendly’ football match against Girrawheen SHS inclusive of all year groups, genders and skill level which will become an annual event. He also implemented the use of an app to allow students, staff and parents to communicate with each other, check scores and fixtures and view player profiles and news updates. Due to his work, attendance rates for his specialist students increased 22%, so much so that the football program has a stronger attendance rate than the whole school attendance. 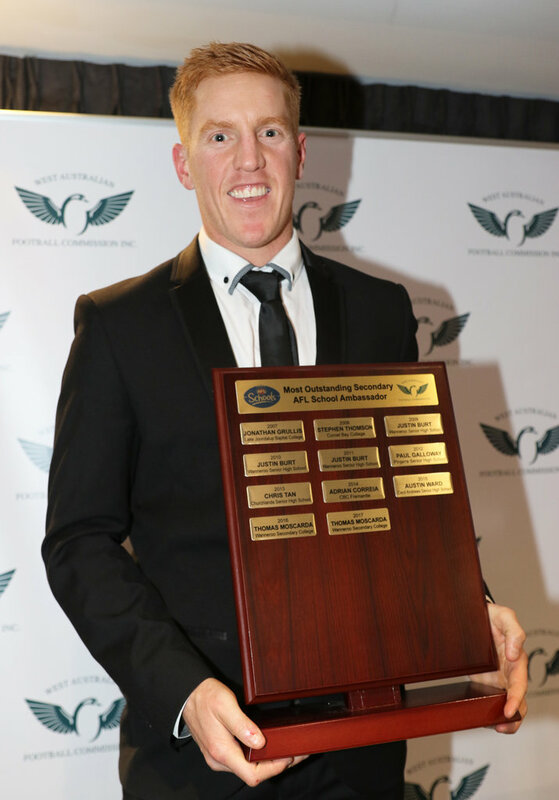 He was also a mentor teacher for an Edith Cowan University student and empowered the student to be fully involved in all aspects of the Specialist AFL program at Wanneroo SC. He is also an assistant coach of the WA State Schoolboys under 15s team. Paul, the head cleaner at Tuart Rise Primary School, assisted other AFLSAs to run a weekly Footy Focus Program before school for 30-40 Year 3-6 students, coached the Dockers Shield team and co-ordinated the Classroom Football Tipping Competition. Paul is a keen Hawthorn supporter but often wears club colours from many different AFL teams to help promote the game around the schoolyard. He also helped in the community where he was the assistant coach of the Jandakot Jets Amateur Football Club. Ray has coached secondary school teams since 1990 and the WA State Schoolboys and Australian National Schoolboys teams. He has taught Australian Football skills to South African primary children at Footy Wild coaching clinics and run training sessions with the South African International team. Ray engaged the school in the Eagles BHP Young Indigenous Mentor Program. Ray introduced a ‘maths in footy’ program to his school and incorporated the ‘development diffusion of AFL as a sport’ into the Year 11 Geography course. Ray is a Division Co-ordinator for the Schoolboys RediMed Cup and is the chief marker of WACE Physical Education Studies AFL practical exams. 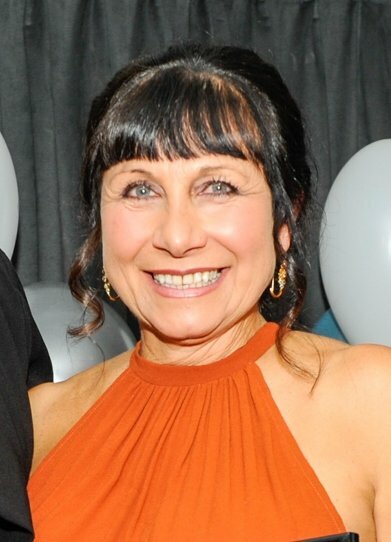 In Term 3, 2014 Narelle wrote, produced and directed a musical for over 250 Pre-Primary to Year 3 students titled Australia: The Sights, The Sounds, The Songs, in which Australian Football was pivotal. Last October Narelle presented at a District Ambassador Induction Course on implementing Australian Football for non-sports teachers. At a new school this year Narelle has led the implementation of an AFL Music and Physical Education program and promoted AFL-themed Literacy and Numeracy. 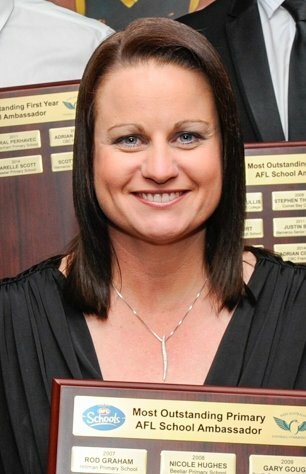 Narelle coached the Dockers Shield Boys and the Dockers Cup Girls Football teams and is in her fourth year as Manager for the School Sport WA State 16s AFL girls’ team. Austin teaches in his school's inclusive Specialist Australian Football Program. Austin assisted in the development of ICT lessons by introducing GPS trackers and Fitbits so students can analyse data to identify ways to improve. He utilises football content in The West Australian newspaper to improve literacy, numeracy and health outcomes. He liaised with the Cecil Andrews Clontarf Academy to enter teams in the Nicky Winmar and Kirby Bentley Cups and engaged Year 10 students in Cecil Andrews’ week-long Annual Roadshow using their newly attained coaching skills for clinics at primary schools. 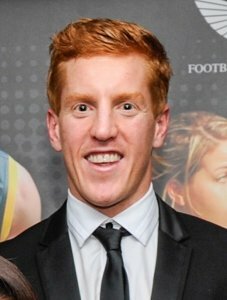 He is an Assistant Coach with the East Fremantle Development Program. 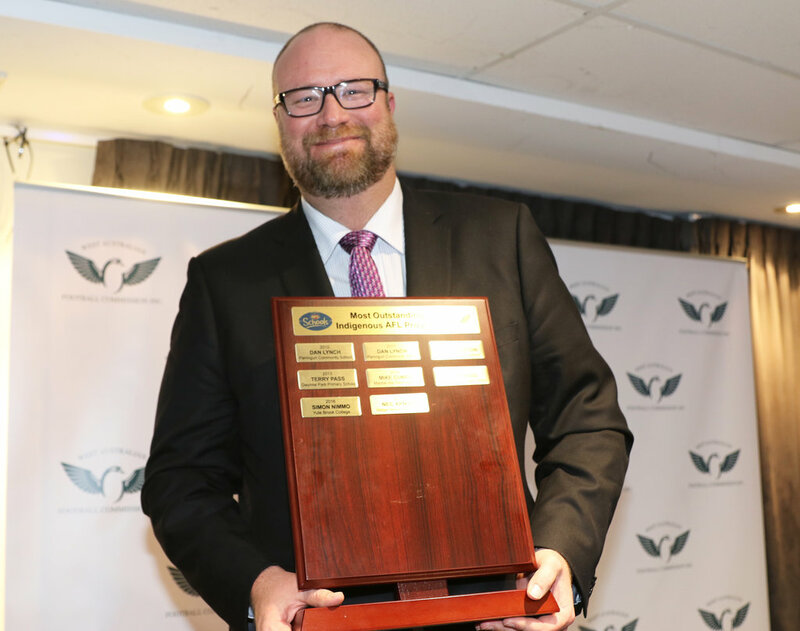 Scott was a new graduate teacher to Wanneroo Secondary College in 2015. He instigated a new relationship with Spring Hill PS by instructing 23 of his Australian Football Specialist students to a level whereby they were competent to deliver a football coaching course to more than 230 SHPS students. Scott is working to create a local area network with secondary and primary school ambassadors, has actively promoted and encouraged attendance in the Djinda Falcons Aboriginal Football Program, coaches the College’s Year 8/9 and Senior Girls programs at the school and promotes the Integrated Football pathway.